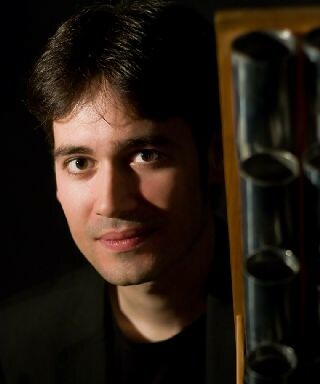 Born in Barcelona, Guillermo Pérez is an internationally recognized organetto player developing an unusual career in the field of medieval music. His interest in the instrumental repertoires of the 14th and 15th centuries led him to the foundation and artistic direction of the well-known ensemble Tasto Solo performing late-medieval instrumental music on gothic keyboards. Since 2003, he has been also working regularly with prestigious specialized ensembles including Mala Punica (IT), Micrologus (IT), The Unicorn Ensemble (AU), Diabolus in Musica (FR), De Caelis (FR), Zefiro Torna (BE) or SuperLibrum (NL), recording CDs for Naïve, Ricercar, Zig-Zag Territoires, Passacaille, Aeon and Pneuma labels as well as for radio broadcasting and television (RNE, Radio France, Klara, WDR, RTV Slovenija…). These CDs won several awards, including prizes like “Diapason Découvertes” and “Diapason d’Or de l’Année”. He’s also regularly guest in France Musique programmes. With the support of the artistic Güell Fundation, Guillermo Pérez has recently been involved in the international Master “Ars Nova in Europa: Ricerca, Analisi, Interpretazione”. His teaching activities have increased over recent years with courses, master classes and lectures in such renowned schools as the Schola Cantorum Basiliensis, Fondazione Cini, Curso de Música Antigua de Gijón, Konservatorium Wien, Corso di Musica Medievale di Orte, and diverse organological recovery projects also fill his time. He is at present doing a research on the musical fragment London B.L. Add. 28.550, known as “Robertsbridge”, with the upcoming article « Robertsbridge Revisitado : Nuevas consideracions históricas y codicológicas », and preparing new studies around medieval German keyboard repertoire. In 2010 he has been invited as an expert jury for the first medieval keyboard Master exam at the Schola Cantorum Basiliensis. Since the same year, he’s directing and teaching the International Blocks Organetto and Instrumental Repertoires from the 14th and 15th Centuries in the CIRMA in Moissac (France), receiving students from all around the Europe. Since 2003 Guillermo Pérez performed concerts and tours in France, Spain, Italy, Belgium, Germany, Austria, Slovakia, Switzerland, Netherlands, Slovenia, Poland, Norway, Lithuania, Latvia, Ireland, Greece, Tunisia and Mexico.